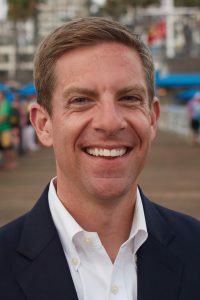 Rep. Mike Levin is the progressive who replaced retiring GOP Rep. Darrell Issa in this northern San Diego seat and flipped it from Red to Blue. Levin, whose mother is Mexican American and father is Ashkenazi Jewish, is an advocate for real immigration reform, Medicare for all, and has focused on reaching out to Jewish voters – the 49th has a larger Jewish population than the national average, making up about four percent of the total population. This is a true swing district and has flipped between parties four times since its creation in the mid-1990s. Levin is working hard to fight back against Republicans’ attempts to undo the progress we’ve worked so hard to make and will champion policies that help move America forward for all. He currently serves on the Committee on Natural Resources.